Learn diesel technology at the best diesel school in the nation and get valuable hands-on training from a Master NATEF Accredited university with ASE Certified Diesel Instructors in the UNOH College of Applied Technologies' diesel department. The Diesel Industry is booming and is a constant factor in our economy. As they say “If you bought it … a truck brought it!” Few programs in the country are growing faster than Diesel. 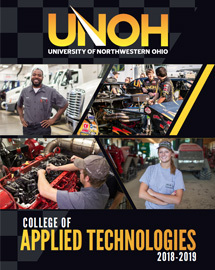 If you are considering a career as a Diesel Technician, the University of Northwestern Ohio is the right choice. The job responsibilities of diesel service technicians are becoming more complex as more electronic components control engine operation. The University's Diesel program is unique because our curriculum is up-to-date with EPA engine requirements. We utilize computer engine programs and our students are taught with modern equipment and training aids. Our students train with the same tools and latest equipment that is found in service centers and dealerships across the nation, using diesel truck and engine manufacturers training aids from: Cummins, Detroit, Caterpillar, DuraMax, Power Stroke and many more. As a student in the UNOH College of Applied Technologies' diesel program, you can also get your CDL. You will gain the classroom and hands-on knowledge you need to pass the state exam with our several big rigs and a specially designed course. Best of all, we pay for your fees when you sit for the Ohio Class A state license which can be transferred out of state. You can choose to enhance your training by applying for the Diesel Advanced Technology Education (DATE) program to become a Professional Level Technician for Mack Trucks and Volvo Trucks. These additional two sessions of coursework will prepare students to be immediately employed at any of the hundreds of Mack and Volvo truck dealerships across North America. All of our students have the opportunity to take ASE tests to become ASE Certified, an industry-wide certification of excellence. As a benefit to you, the University will cover the cost of up to two ASE tests for each student. Training in these courses is hands-on, using diesel training aids from: Cummins, Detroit, Caterpillar, DuraMax, Power Stroke and many more. As a student in the UNOH College of Applied Technologies' diesel program, you can also get your CDL so that you will be prepared to test drive a diesel semi-tractor trailer outfit. 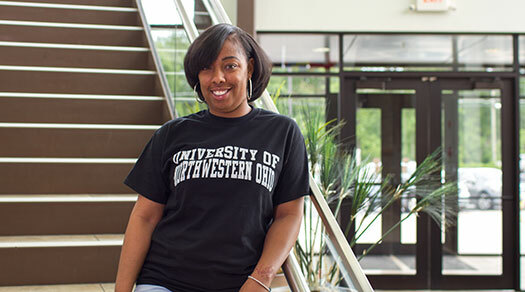 *Percentages are based on surveys of our 2013-2015 academic year diesel technology associate degree and diploma graduates who reported they are employed or are continuing their education within 6 months of graduation from the University of Northwestern Ohio. There was a 73% response rate to this survey.